FLY ASH CONCRETE - WHAT ARE THE REASONS FOR ADDING FLY ASH TO CONCRETE? Fly ash concrete is basically the same as regular concrete except some of the cement has been replaced with a material called fly ash. 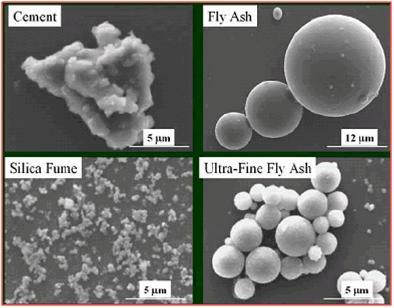 WHAT IS FLY ASH CONCRETE AND HOW IS IT MADE? Before coal is consumed in a power plant, it is first ground into a fine powder. This coal powder is blown into the power plant's boiler, the carbon is consumed leaving molten particles rich in silica, alumina, and calcium. These non-combustible particles solidify as microscopic, ball bearing like, glassy spheres that are collected from the power plant's exhaust before they can fly away. This leftover ash from burning the coal is called fly ash. Chemically, fly ash is a pozzolan. When mixed with lime (calcium hydroxide), pozzolans combine to form cementitious compounds. Fly ash in concrete contributes to a stronger, more durable, and more chemical resistant concrete mix. The main benefit of fly ash for concrete is that it not only reduces the amount of non-durable calcium hydroxide (lime), but in the process converts it into calcium silicate hydrate (CSH), which is the strongest and most durable portion of the paste in concrete. 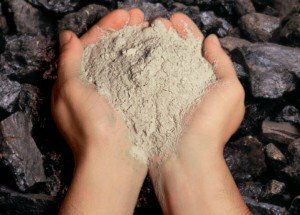 WHY SHOULD YOU CONSIDER FLY ASH CONCRETE? The paste is the key to strong and durable concrete, assuming average quality aggregates are used. At full hydration, concrete made with regular cements produce approximately 1/4 pound of non-durable lime per pound of cement in the mix. A typical concrete mix having 470 pounds of cement per cubic yard has the potential of producing 118 pounds of lime. Fly ash chemically reacts with this lime to create more CSH, the same "glue" produced by the hydration of cement and water. By producing more CSH the paste becomes stronger over time and also closes off more of the capillaries that allow the movement of moisture through the concrete. The result is a stronger, more durable concrete that is less permeable, which aids in the reduction of efflorescence. Efflorescence (white, chalky substance on the surface) is caused by the face of the concrete being wetted and dried repeatedly, or by the movement of water vapor from the damp side of the concrete to the dry side through the capillaries (voids), drawing out the water soluble lime from the concrete. The "ball bearing" effect of fly ash creates a lubricating effect when concrete is in its plastic state. Workability, concrete is easier to place with less effort. Ease of pumping, pumping requires less energy and longer pumping distances are possible. Improved finishing, concrete is creamier with clear sharp architectural patterns easier to achieve. Reduced bleeding, fewer bleed channels decrease permeability and chemical attack. Reduced segregation, improved cohesiveness of fly ash concrete reduces rock pockets, air voids, and bug holes. Higher strength, fly ash continues to combine with free lime increasing compressive strength over time. Increased durability, dense fly ash concrete helps keep aggressive compounds on the surface. Reduced shrinkage, the lubricating action of flyash concrete reduces water content and drying shrinkage. Reduced heat of hydration, the pozzolanic reaction between fly ash and lime generates less heat, resulting in less thermal cracking when fly ash is used to replace portland cement. Reduced alkali silica reactivity, fly ash combines with alkalis in cement that might otherwise combine with silica from aggregates, causing destructive expansion. More than 12 million tons of coal fly ash are used in concrete products each year. The use of fly ash, a recovered resource, reduces the depletion of natural resources. It also reduces the energy intensive manufacturing of portland cement. This reduction in energy leads to less emissions of greenhouse gases. The use of a ton of fly ash to replace a ton of cement saves enough electricity to power an average american home for 24 days. It also reduces carbon dioxide emissions equal to two months use of an automobile. Fly ash use in concrete qualifies for credit under the U.S. Green Building Council's popular LEED rating system for sustainable construction. The environmental benefits of fly ash concrete might be a good enough reason to consider it for your next concrete project.